Grapes of Wrath is a modification of a traditional pattern called Grape Basket. The block can remind us of a new version of the "John Brown Song," written in late fall, 1861. Julia Ward Howe's biography tells the story of how she came to write the "Battle Hymn of the Republic" on a visit to Washington City. 'I have often wished to do so!' she replied. Waking in the gray of the next morning, as she lay waiting for the dawn, the word came to her. 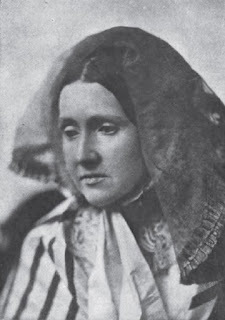 The first draft, pictured in her biography. She was used to writing thus; verses often came to her at night, and must be scribbled in the dark for fear of waking the baby; she crept back to bed, and as she fell asleep she said to herself, 'I like this better than most things I have written.' In the morning, while recalling the incident, she found she had forgotten the words. She did not, however, realize how rapidly the hymn made its way, nor how strong a hold it took upon the people. It was 'sung, chanted, recited, and used in exhortation and prayer on the eve of battle.' It was printed in newspapers, in army hymn-books, on broadsides; it was the word of the hour, and the Union armies marched to its swing. Her song still has a strong hold upon Americans. Her poetic phrases, many drawn from her knowledge of the Bible, have become icons in the American language. The Grapes of Wrath (borrowed by John Steinbeck for his book about the Great Depression) comes from a description in the Book of Revelations of fruit pressed into "the great winepress of the wrath of God." The Ladies' Art Company pattern business sold this design as Grape Basket (BlockBase #712) beginning in the late 19th century. Similar patterns date back to the time of the Civil War. This week's block has a similar look with fewer pieces. A - Cut 1 background square 2-1/2". B - Cut 1 background square 5-1/4". Cut into 4 triangles with 2 diagonal cuts. You need 2 triangles. C - Cut 2 background rectangles 2-1/2" x 4-1/2". D - Cut 1 gold square and 1 background square 4-7/8". Cut each into 2 triangles with a diagonal cut. 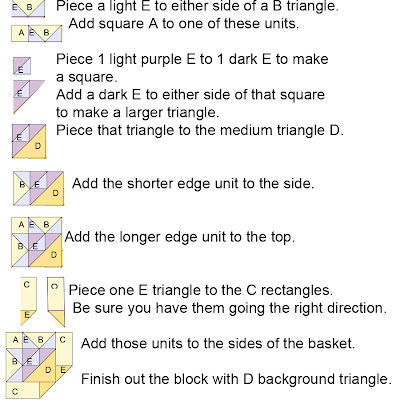 You need 1 triangle of each. E - Cut 3 light purple and 2 dark purple and 1 gold squares 2-7/8". Cut each into 2 triangles with a diagonal cut. 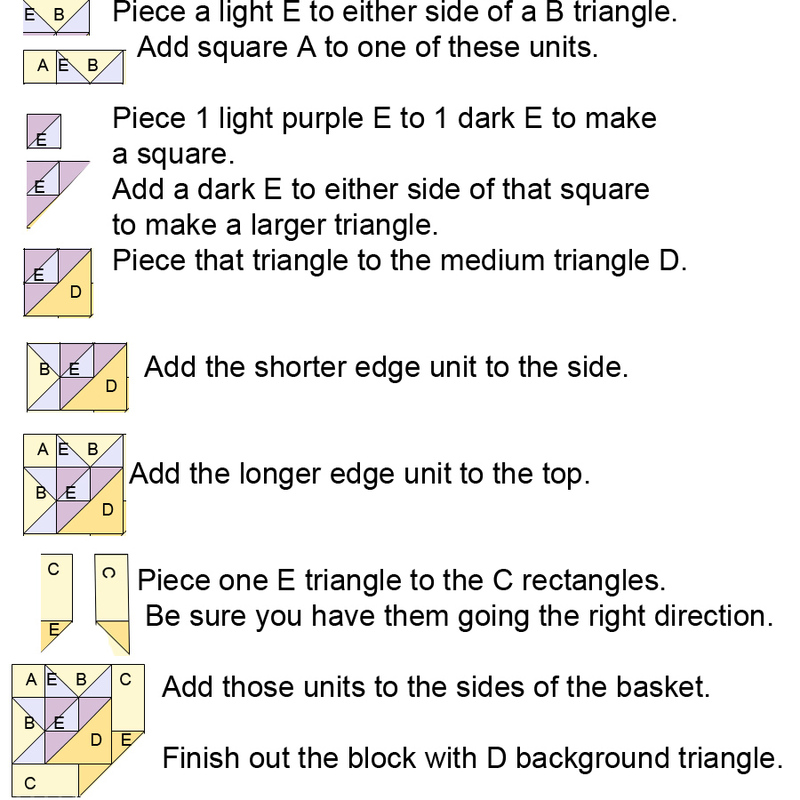 You need 5 light purple, 3 dark purple and 2 gold triangles. Thank you fro sharing the blocks. That was such an interesting story....I've always loved that song, but didn't know the history of it. Thanks! Can't begin to tell you how much I am enjoying your blog and the patterns and history your sharing with us. Will you make this into a book someday? Hope so-it would be a great book on Civil War history alone. Thank you so much! Love it!!! Mine eyes have seen the Glory!! Thank you so much for a wonderful story and the block to go with it!! Thank you. I have been enjoying all the blocks. I have fond memories of teaching a beginning quilter years ago to make a baby quilt out of this block. A pretty block and I love the song. 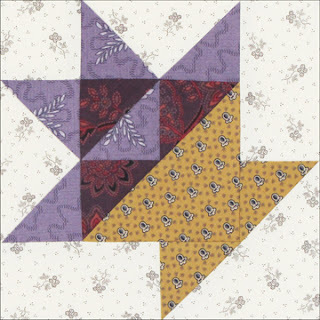 I have completed my block and posted it on my blog along with a how-to. Thank you for sharing your time, talent and knowledge by providing these blocks each week. I'll be watching for the book.